The United States District Court for the District of Kansas (in case citations, D. Kan.) is the federal district court whose jurisdiction is the state of Kansas. 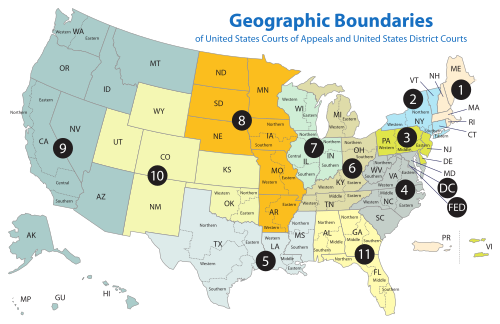 The Court operates out of the Robert J. Dole United States Courthouse in Kansas City, Kansas, the Frank Carlson Federal Building in Topeka, and the United States Courthouse in Wichita. The District of Kansas was created in 1861, replacing the territorial court that preceded it, and President Abraham Lincoln appointed Archibald Williams as the Court's first judge. Appeals from the District of Kansas are made to the United States Court of Appeals for the Tenth Circuit (except for patent claims and claims against the U.S. government under the Tucker Act, which are appealed to the Federal Circuit). The Clerk of Court is Timothy M. O'Brien, who is located in Kansas City. 4 William Cather Hook KS 1857–1921 1899–1903 — — McKinley appointment to 8th Cir. 6 George Thomas McDermott KS 1886–1937 1928–1929 — — Coolidge appointment to 10th Cir. 10 Delmas Carl Hill KS 1906–1989 1949–1961  1957–1961 — Truman appointment to 10th Cir. ^ Recess appointment; formally nominated on December 14, 1863, confirmed by the United States Senate on March 15, 1864, and received commission on March 15, 1864.